Click here to order in the BYU Choirs online store! 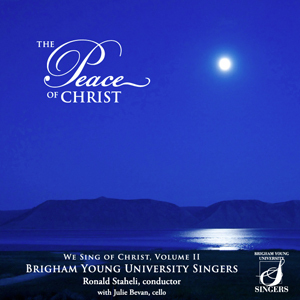 The Peace of Christ, envisioned as a follow-up to BYU Singers’ first CD, We Sing of Christ, uses a wonderful mixture of new arrangements of hymns and anthems to speak directly to the depths of our hearts and souls. Join Ronald Staheli and the BYU Singers as they use music to express the peace that is offered to all of us by Christ. Click on any title to hear a 30-second sound clip.